This tourist and cultural route begins in the Cruz Grande, the point where the most important streets of the municipality lead into the main centre. From here, we continue towards the Rambla street, where two bourgeois houses are located: the Alcázar de la Sultana and the Palacete of los Soler. Once again on the Cruz Grande, we turn left and go into Convento street, where the Church of San Francisco is located. We follow this street until we reach the intersection of Pilar street with Hospicio street. Pausing to gaze at the Church of San Sebastián, we climb up Pilar street until we find the Palacete of los Toledo on the right side. At the end of this street, between Constitución square and the Glorieta Sotomayor, we find the Church of Ntra. Sra de la Encarnación; opposite this church we can gaze at another emblematic building, in the form of Cuevas del Almanzora, the Palacete of the Figuera and the Old Casino, which is located in the corner of the Glorieta Sotomayor and the Rambla street. Going back on the short tour we have made, we arrive at Constitución square to make an unhurried visit to the Palacete of Torcuato Soler Bolea. When we exit from this small palace, next to the fountain, we can note a statue of José Mª Muñoz y Bajo de Mengíbar, most popularly known as the “Black Saint”. This square is also overlooked by the Town Hall. To end this visit, we climb up by San Diego street or slope, until we reach Plaza de la Libertad square, where the most significant monument in Cuevas del Almanzora is placed. The Marqués de los Vélez Castle, declared as a Historic National Monument, is worthy of a tour inside, as it houses the following buildings: the Homage Tower, the Marquis Palace and the Tercia House. Behind the Castle, the Hermitage of San Diego or Calvario is found and at its feet the Cave-Museum which adds the final touch to this enriching visit by the civil and religious legacy of Cuevas del Almanzora. We begin this route in the Cave-Museum, it is a house built in the middle of 20th century and composed of three rooms: the hall, the kitchen-dining room and one or two bedrooms. In this house, a prehistoric tradition that forms part of our cultural heritage can be found. From here, we can contemplate the Hermitage of San Diego or Calvario (16th century), one of the oldest religious buildings in Cuevas del Almanzora, the Sacred Heart statue is also in this hermitage. Following this, and bordering the Castle on the left side, we find the Libertad or Castillo square, where the Marqúes de los Vélez Castle is erected (16th century). A Historic-National Monument, it houses the Homage Tower, the Marquis Palace which is the headquarters of the Museum Antonio Manuel Campoy and the Tercia House which includes the Archeological Museum, the Historical Archives, the Municipal Library and the Exhibition Room la Tercia I. Going down the castle slope, we reach Constitución square. On this square sits the Town Hall (19th century), a neoclassic building, features such as the veranda on the second floor and the embossed circle where the municipal clock is placed stand out. In the same square, but on the right side, the Palacete of Torcuato Soler Bolea is located, and this is the best example of a neo-classical bourgeois house of 19th century; two big columns that decorate the main façade stand out, as well as the plaited grilles that protect the bays of the three floors. Inside, a spectacular staircase flanked by two double marble columns can be seen; on the first floor we can see a wood panelling with colour stain glass window, the biblical paintings on the Mayor’s office door, as well as numerous details in plaster and the tempera painting in the noble rooms. These two buildings now house the municipal offices. We go on by the Pilar street and stop off to enjoy the tranquility of the Church of Nuestra Señora de la Encarnación (16th century). It is a national artistic-historic monument and the second biggest religious building in Almería. It was built on the same spot as the old Arab mosque and combines the neo-classical style of the main door with the baroque of the lateral and interior doors; the layout is a Latin cross and it has 3 naves and 10 chapels and houses the most important statues of the Holy Week in Cuevas. Opposite the church we can find the Palacete de los Figueras (19th century) which keeps the typical features of the bourgeois houses, except for the stone balustrade of the first floor. We pass through the Glorieta Sotomayor to get onto the Rambla street, where we can see the Palacete de los Soler (19th century) on the left side. The wooden bay window of the first floor stands out and also the big door through which the carriages once entered through. Next to this small palace, we find the Alcázar de la Sultana (19th century), an example of the Muslim past, which also served as the winter house of the poet Sotomayor; it is a neoclassic house with Arab decorative elements. We end in the Cruz Grande, where this stunning route by the most emblematic buildings in Cuevas del Almanzora concludes. In the Palaeolithic period, people lived in caves to protect themselves from bad weather and wild animals. Later on (10.000 B.C, the beginning of the Neolithic period) some settlements arose such as Los Tres Cabezos, Almizaraque, Las Herrerías, La Ballabona, Cave of la Zahara (the oldest) and the Caves of Calguerín. In the year 3.000 B.C, the Bronze Age, pure silver and silvery galena, a mixture of silver and lead, was obtained from Los Lobos. Fission techniques began to be used. 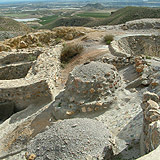 The settlements were located in strategic top hills and also in the plains of the Almanzora River. The houses were square or rectangular, with one or two rooms, the walls made of sun-dried bricks which were placed on a stone base, and supported along its entire perimeter with wooden posts. Farming, hunting, fishing and agriculture were the predominant activities. In 10th Century B.C. the ancestors of Almizaraque dedicated themselves to fishing, taking molluscs, pottery and the manufacturing of weapons and instruments made of copper and silver, amongst others. They did not wear animal skins but manufactured fabrics and their behaviour was cordial and civilized. The Phoenicians arrived and realized the great mining richness; therefore, they began to exploit the Herrerías’s mines. In the 3rd century B.C, the Phoenician town of Baria is consolidated. The main features of the houses were stone walls with pavements of slabs made of slate, brick or mud; from which the sun-dried brick walls and the roof supported by wooden posts were erected. Native people rose up to prevent the Phoenicians continued exploiting the Herrerias mines, prompting the Phoenicians to ask for help from the Carthaginians to face the uprising. At this moment, Cartago joined the strip mining. This fact, together with the Carthaginians dominating the North of Africa, caused the rise of the Romans (due to its limited expansion) and the Punic Wars took place (2nd-3th century B. C), in which the Romans finally defeated Carthage, and continued exploiting the mines. The year 711 is characterised by a Muslim dominance, in which Arabs, Berbers and Muslims of Syrian origin settled with an interior population, and the area of the current Cuevas and Baria was unpopulated. This change of location was due to people not being dedicated to mining anymore, with a shift towards farming. 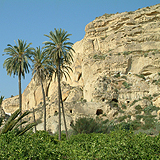 The Calguerín caves served as refuge for the Arabs from Christian attacks. At the beginning of 16th century, the Spanish Reconquest of the Catholic Monarchs took place. The Muslims were obliged to convert to Christianity (known as Moriscos) and forced to renounce their religion and customs. In the 80s, the Moriscos rose up against their oppression but they were defeated and expelled. Cuevas remained almost unpopulated, apart from some Christians, those who had remained and others who came from other provinces, occupying the houses and lands of the Moriscos. In 1503, D. Pedro F, received Cuevas and Portilla by the Catholic Monarchs. 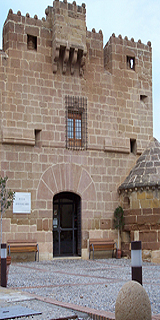 It is believed that the Marquis Castle occupies the location of an old Roman tower, later remodeled by the Muslims and it was enlarged as a walled fortress in the 16th century by Pedro F.
The Church of la Encarnación was built in 1758 on the same place where the Mosque was situated. In 1842 the half of the houses were demolished. They were not in disrepair, but people wanted to rebuild them to give them a more stately aspect, as a signal of the richness generated by the mines. Marble was placed on the corbels of balconies and front doors, the doors were carved, balconies and windows with wrought iron, amongst other features. Streets were made wider and linear. They were not asphalted, but paved or land made. There were stone dykes to stop rain and to avoid it sweeping along the land; the pavements were made of stone. In 1879, an enlargement of the town was made, and the Bravo quarter was built; these houses were occupied by the caves’ inhabitants, and at the same time, the caves were rebuilt by other people. In 1885 the decline of the Almagrera mines began, therefore, the town did not continue with its enlargement. In 19th century, there were 1755 buildings in Cuevas, 888 of which were one-storey buildings, 705 were two-storey buildings and 162 were three-storey buildings. Also there were 400 inhabited caves. In 1910, Cuevas’s population was 26.130 inhabitants, but due to the mining decline, agricultural drought and later the Spanish post-war period, much of the population emigrated to Switzerland, Germany and France. In the 60’s most of the people emigrated to Catalonia. We can say that in the 19th century, the small palaces that were built as a sign of the richness generated by the mines predominated, and new quarters emerged such as the Bravo Quarter. In the 20th century, buildings began to be built in the Avda. Barcelona. This type of building meant saving space because many houses could be built in the same space that only one house occupied before. These new houses were much smaller than in the previous century. Due to a birth rate decrease, the number of occupants was smaller therefore such big houses were not needed. In the 21st century, the construction of buildings has increased notably, but also maisonettes and residential areas have been built, reflecting improvements in the local economy. These new buildings have created a significant expansion of Cuevas del Almanzora. This tourist and cultural route begins in the Cruz Grande, the main centre where the most important streets of the municipality lead into. From here, we follow towards the Rambla street, where two bourgeois houses are located: the Alcázar de la Sultana and the Palacete of los Soler. Once again in the Cruz Grande, we turn left to go into the Convento street, where the Church of San Francisco is located. We carry on by this same street until we reach the intersection of Pilar street with Hospicio street. Pausing to gaze at the Church of San Sebastián, we climb up the Pilar street until we find the Palacete of los Toledo on the right hand side. At the end of this same street, between Constitución square and the Glorieta Sotomayor we find the Church of Ntra. 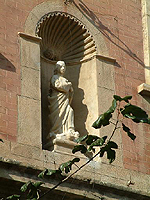 Sra de la Encarnación; opposite this church we can gaze at another emblematic building of Cuevas del Almanzora, the Palacete of the Figuera and the Old Casino is located in the corner of the Glorieta Sotomayor and the Rambla street. Going back on the short tour we have made, we arrive at Constitución square to make an unhurried visit to the Palacete of Torcuato Soler Bolea. When we exit from this small palace, next to the fountain, there is a statue of José Mª Muñoz y Bajo de Mengíbar, most popularly known as the “Black Saint”. This square is overlooked by the Town Hall. To end this visit, we climb up by San Diego street (or slope), until we reach Plaza de la Libertad square, where the most significant monument in Cuevas del Almanzora is placed, the Marqués de los Vélez Castle, declared a Historic National Monument; it is worth touring inside as it houses the following buildings: the Homage Tower, the Marquis Palace and the Tercia House. Behind the Castle, the Hermitage of San Diego or Calvario is found and at its feet the Cave-Museum which puts the final touch to this enriching visit by the civil and religious legacy of Cuevas del Almanzora. This route we suggest by the surroundings of Cuevas del Almanzora begins at the Park Luis Siret. It is recommended to make this tour with a vehicle. Following the road to the Reservoir, in the ascending direction, we find the Almanzora River bed on the right. Once we have left the town behind, we direct our vision toward the left side to contemplate the strange and amazing landscape which is Calguerín; it is a prehistoric enclave made of caves, palm trees and trees which make it a most picturesque spot. In fact, this place has been a source of inspiration and place of residence for artists and poets such as José Mª Alvaréz de Sotomayor for many years. We follow the road towards the Resevoir of Cuevas del Almanzora, but before arriving, on the right side, and just in the stilling basin, we stop to take a closer look at the Artificial Lake which was built to accommodate rowing and canoeing competitions in the 2005 Almería Mediterranean Games. When we reach this point we cannot leave without visiting the Reservoir. From this wonderful place, we have superb views of the municipality. It is recommended to make this tour with a vehicle, because it goes all over the surroundings of Cuevas del Almanzora. We take the road towards Vera, until the intersection of Palomares. Here we turn left and, after 4 kilometres, we pass through a small parish called Las Cunas. On the left we go into the access way to Desert Springs; a residential resort composed of a big residential area and a golf course of 6170 m and 18 holes, surrounded by strategically placed cacti, rocks, bunkers and streams. In fact, this is the first desert course in Europe. We come back to the road to go to Palomares, where we can see some mining remains such as a chimney coming from the foundry of San Francisco Javier. Then, at the roundabout of the petrol station we turn on the left to visit Villaricos, a welcoming and historic enclave presided over by the Castle, built in the 18th century as a defensive bastion, and formed of two floors and a bay window. In summer, this wonderful civil building becomes the tourist information office and the exhibition room. From here we can access the centre of the village, where we can walk on the promenade seafront, contemplate the Balsica and la Esperanza harbours as well as taste the typical cuisine of the area in its different restaurants. Out of the village, towards Aguilas, are the Sierra Almagrera towers; an area where silver and lead were extracted during 19th century and the beginning of 20th century. Nowadays, we can see many remains, which are the silent witnesses of the mining era splendour which gave so much richness to the municipality; chimneys, calcination furnaces, loading platforms, wells, and underground passages follow one another along the coastline together with numerous beaches and unspoilt coves. Towards Herrerías, and leaving behind Sierra Almagrera, we follow the road, seeing mining remains. On the left side of the road we can contemplate the mining settlement and at the back of this, remains of the old drainage system. When we arrive at Las Herrerias, we can see in the top of the village the Pozo Alianza and a little further on the Church, which was built by Luis Siret. Towards Cuevas del Almanzora and two kilometres before arriving, there is a deviation on the left up to the rambla of Jucainí, which leads us to the last place included in this visit which is the Fuente Álamo Site, in the foothills of Sierra Almagrera. It was excavated by the Belgian engineer Luis Siret and, once we arrive there, the settlement belonging to the Bronze Age (Argar culture) can be seen. Once we have visited this historical enclave, we come back to Cuevas del Almanzora, where our visit ends.